If you wanted to know how I felt about adopting a pet, you’d only have to look at household. The majority of my zoo crew has been adopted from a shelter, rescue, the vet clinic I worked at or I found them. Four of my current crew I found through Petfinder (2 pets who are now at the Rainbow Bridge were also found on Petfinder, 1 was featured as a Petfinder Happy Tail in 2008). So as an adopter and a big fan of Petfinder, how could I not help spread the word about adoption. On March 15 (their 15th birthday! ), Petfinder is asking everyone to help promote pet adoption. From adding a badge to your website to featuring an adoptable pet from their Adopt-the Internet-All-Star Gallery as your Facebook profile picture and posting a message about pet adoption, there is something everyone can do. 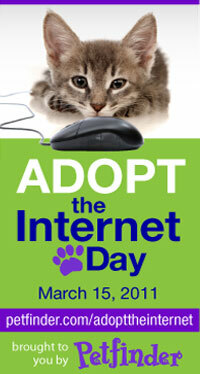 Join me in spreading the word about Adopt the Internet Day, you can find more suggestions on how to do this at Petfinder. As a blogger, I’ll be writing a post about adoption for March 15th, but I’m also going to do a couple more of their suggestions. They don’t take much time, but they will do a lot to make people aware of the adoption option when they decide to add a pet to their family. Yay! Great post. I’m so glad you decided to participate. This is such a wonderful idea, isn’t it?!? Such a simple way to help homeless pets find their forever homes!